Heartbreaking, yet inspiring: Actress sings with 300 bereaved mothers at 'One Family' conference. Popular actress Osnat Vishinsky joined a panel discussion last night on the topic of Grief and Faith at an assembly hosted by OneFamily in Jerusalem. The event was attended by 300 bereaved women and female terror victims. Vishinsky, who lost her son Lior, z”l, in a tank explosion on the Philadelphia Route in 2004 appeared on stage along with Israel Prize winner Miriam Peretz, mother of Uriel and Eliraz, who both fell in combat while serving in the IDF; and Devorah Gonen, mother of Danny, z”l, who was killed in a terrorist shooting in 2015 on the outskirts of Dolev. “My siddur, (prayer book) is drenched with tears, and I gain comfort from this, but it doesn’t have to come from the siddur. There are mothers among us who don’t pray, and that’s okay. My mother in Morocco didn’t know how to pray, either. She didn’t know how to read or write, but every morning she placed her hand on the mezuzah and stood there locked in prayer for a half-hour, entreating the Holy One that He should not let her witness the deaths of her grandchildren or children. She also prayed for the entire Jewish nation,” related Miriam Peretz. Peretz’s moving portrayal touched Osnat Vishinsky who, turning to the emcee, IDF Casualty Department former director Lt. Col. (res.) Alona Solomon asking to lead the audience in singing the words of the Prayer for the Welfare of the State of Israel. Vishinsky shared that on a journey to Poland, she visited a synagogue that had survived the Holocaust destruction. There, she heard an Israeli officer singing the Prayer for the Welfare of the Jewish State that is recited on Shabbat and holidays in many synagogues in Israel and the Diaspora. Vishinsky began the first notes of the song and was soon joined by the voices of 300 women attending the event. “We know the price of this song! We are praying, and with this prayer, we know that we paid the highest imaginable price for the revival" of the State, an emotional Miriam Peretz expressed at the end of the song. 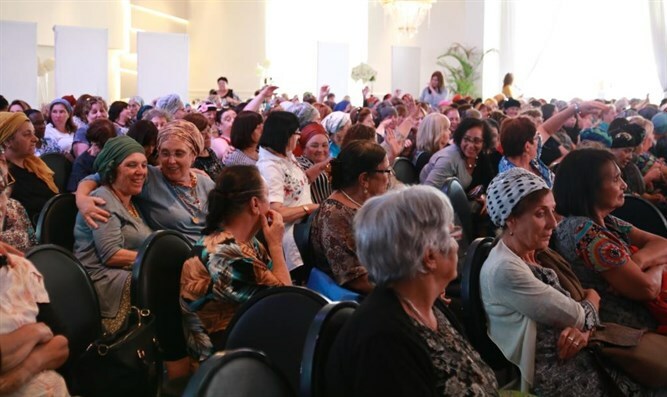 The annual women’s convention of OneFamily, which supports bereaved families and terror victims, is held every year during the days prior to Tisha B’Av, and is dedicated to helping women cope with grief. This year’s assembly was attended by journalist Sivan Rahav-Meir, MK Aliza Lavi, Col. (res.) Ronit Lev, Rabbanit Yemima Mizrahi, and journalist Emily Amrousi.